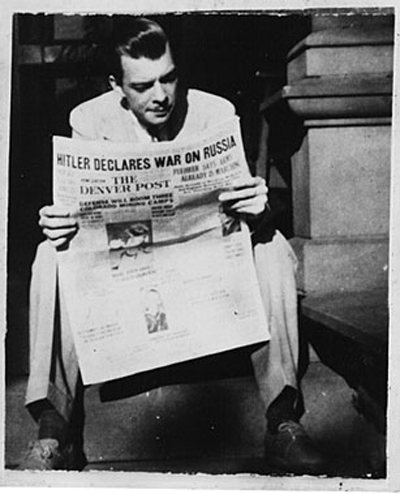 Coilhouse » Blog Archive » Whatever Happened to Weldon Kees? An existential terror underpins much of his poetry, its landscape shuttling between literal urban settings—bars, restaurants, sophisticated parties—to a more psychological locale of fear and trembling. He sometimes wrote nervous little narratives about a chap named “Robinson,” perhaps a doppelganger, notable mostly for the absence of his presence (or the presence of his absence). Auden may have defined the mid-20th Century as “The Age of Anxiety” but it was Kees who actually walked that talk. His free verse exhibits a formal quality, his formal verse a natural ease. I love the darkness in Weldon’s work and the technical virtuosity. He moved to NYC to rub elbows with lit crits and bohemian intellectuals, but never felt entirely comfortable in their company. 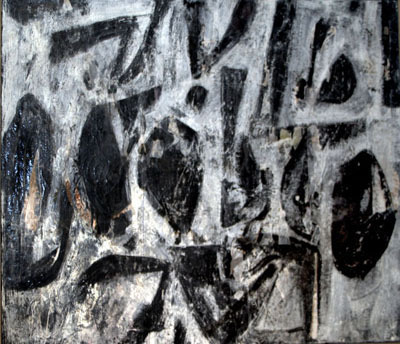 He started painting and some of his work ended up hanging in the Whitney alongside Picasso and de Kooning. 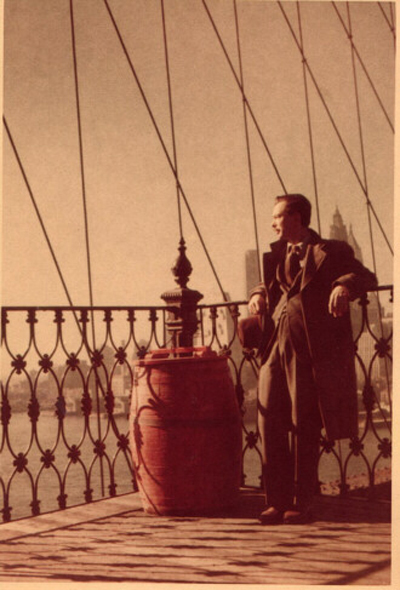 Despite enjoying a large degree of success in several different mediums, Kees’ nervousness and depression were exacerbated by the New York lifestyle. He moved with his wife Ann to San Francisco in 1950 and got involved in the Beat scene, shooting experimental films and composing the music for short films made by other directors. Things continued to unravel. Ann, a long-suffering alcoholic, developed acute mental illness and they divorced. He filled his life with dozens of different projects, perhaps in an attempt to mask growing feelings of desperation and despair. On July 15, 1955, Kees’ Plymouth Savoy was found on the foggy north side of the Golden Gate Bridge, keys still in the ignition. When friends searched his apartment, they found no signs of life or living besides his cat, Lonesome, and a pair of red socks soaking in the sink. His wallet, watch, savings account book and sleeping bag were missing. He left no note. To this day, no one is entirely sure if Weldon Kees jumped off the Golden Gate Bridge, or went to Mexico to start a new life, as he’d often threatened. Rumors and sightings circulated for many years. It’s hard to articulate what exactly keeps me coming back to the man’s life and creative output over and over again. I think it’s his sincerity, frankness, and above all, the undercurrent of calm self-assurance that flows through even his most unsettling verse. He was a restless man who achieved an intense serenity through creating, and I admire that more than I can say. 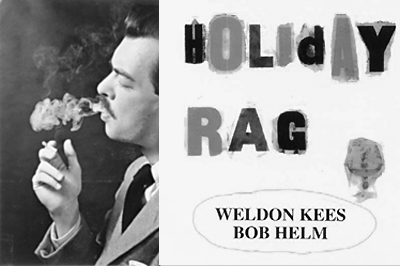 Holiday Rag (Badger Press, 1998) is a selection of original songs and jazz standards by Weldon Kees and SF Jazz Revival clarinetist Bob Helm. The CD contains 17 tunes selected from demo tapes recorded by Kees and Helm in the early 1950s. The more-than-capable Kees sings and plays piano, and his original lyrics are alternately morbid and hilarious. Think Dorothy Parker by way of Jelly Roll Morton. To order copies, write or e-mail Barry Thorpe, PO Box 888, Trinidad, CA 95570, [email protected]. Sounds like he’s got truly mad skills. I’ma definitely have to check him out further. Wicked enigmatic ending! Hey Mer, do you think he went the suicide route or is it your feeling that this guy would be down for total life reinvention? I’m a huge Frank O’Hara fan- “At the Movies With Weldon Kees and Frank O’Hara” was an interesting read. Now I’m curious to know more about Kees. Also look up the disappearing Arthur Cravan. A nice read, thank you. Just what I needed! Dovanna, if you like Frank O’Hara, chances are (as you’ve read) quite good that you’ll enjoy Kees, although he’s less about irony, more about the yawning existential horrors. Skerror, rest assured I count myself to be among the poorest of rabble. Pass the Cheetos. Most of Kees’ closest friends seem to think he killed himself. While I personally love the stories of people who knew him swearing up and down to have seen him hanging out at bars in New Orleans, or in Mexico City, your guess is as good as mine. He’d be in his nineties now. Disappearances are eerily fascinating. I would like to think that Kees is in a secret bar hidden deep underground knocking back a couple drinks with Oscar Zeta Acosta and Ambrose Bierce. Somehow I doubt that though (especially as Bierce would be approaching 170 years old). I want to plant a big, wet one on you for posting this. I’ve always preferred the idea that he simply vanished from history south of the border, than he leaping from the Golden Gate. Well done, Meredith! Excellent essay, and now my day is a wreck – I now gotta go find out all about this fella, and even as I do, I know I’ll be struggling with depression and inspiration in equal measure: This guy did everything, and I wanna be just like him, which means I too will all but vanish in obscurity, so why bother? The standard curse of the creative, I suppose…. Now, off to have my productivity siphoned off by teh internets! New to me, thank you!